This print and fulfillment project went international. 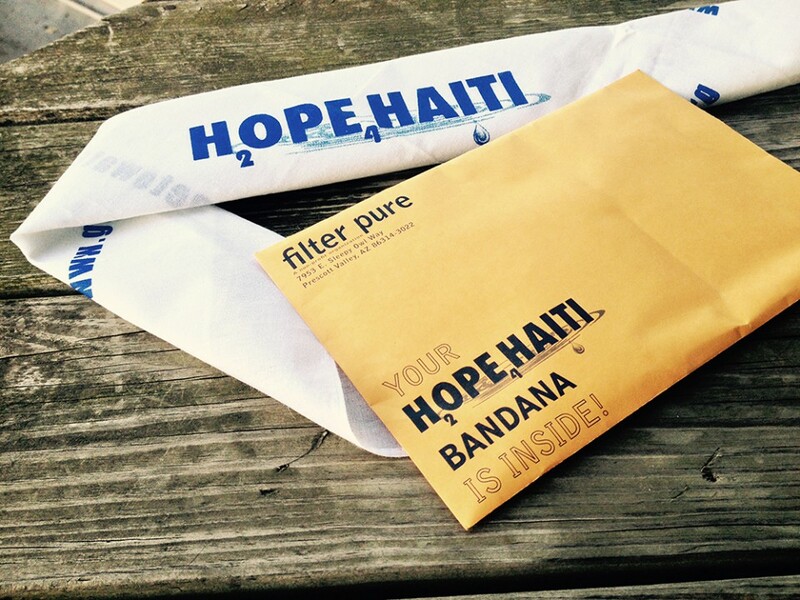 Not only were these Hope 4 Haiti bandanas used for incentivizing donors to contribute, they were given out in Haiti by Filter Pure workers! Our goal was to increase donations with the incentive and enhance visibility of the brand with a fashionable custom product the receiver would wear. The custom bandana would communicate a high-perceived value and start conversations about the cause and their donation. The first step was analyzing postal rates, weights and envelope sizes that would allow for the most cost-efficient mailing of the custom bandana. After the cost and mailing specifics had been determined, the dream team competitively bid the custom bandanas with several pre-qualified ASI suppliers. We looked for the highest quality material with the largest imprint area and best volume pricing. We decided on a 22×22″ white cotton bandana with reflex blue imprint. The customer requested a very simple design as the organization was multi-lingual and operated in several countries. They needed to be easy to read no matter where in the world you stood! We selected durable brown kraft envelopes that would be highly visible in your stack of junk mail. Our kitting and fulfillment team went to work folding and inserting the bandanas, along with a thank you/business card. After the initial mailing we stored the balance and completed the print and fulfillment project on a monthly basis. Have a print and fulfillment project that requires special attention? Visit our Direct Mail Services page or call today for a free consultation.